the creation of a Jewish state. they're embarked on a futile task. It all adds up to rhetoric." "great warmth for both men,"
this; it will help to bring peace." [ex., of the Council of Jewish Federations and Welfare Funds. h UJA's current effort to bring together $300 million cash. "n will be held in the home of Irene Danker in Bay Colony. Max I.
nt, author and lecturer, will be the guest speaker. -t*cted to attend from all parts of North Broward. not endanger her very existence." but not from the Israeli people,"
that cannot be defended. "But,"
unless they have a helping hand. needed by the people of Israel. and prosper in times of peace. behalf of Jews the world over. ditional time making phone calls. Romanoff and Rabbi Leonard S.
of general and Jewish causes. Dr.
treasurer of the Broward Coun. serves all of west Broward. and the State of Israel." chairman of the United Jewish Appeal. understand Jewish tradition and honor it. ror generations a symbol of Jewish tradition. i in Greater Fort Lauderdale. 1 Aether with Israel as one." Sates to impose a settlement. and Israel so deeply desire. p.m. in the Bermuda Club. listened to what I had to say." the same territory," she said. or the U.S. with another country. OF WHAT VOUVE SHOT... |f>? MAIL YOUR FILM OR NEGATIVES TODAY. USE THIS HANDT ORDER FORM. 4% FLORIDA SALES TAX $. :. between Israel and Egypt.
! ;: Minister Begin and an address by Sadat to the Knesset. x courageous step that he took in offering to come to Israel. x the controversy could not have easily predicted. ij: private and for for the record. because it gives de facto recognition to the State of Israel. United States, can also boast. | 1948 demonstrates the principle. :: "moderation" in contract with Israel's "intransigence." does she do that without playing into Arabdom's hands? This is what is at issue in the haste toward Geneva. 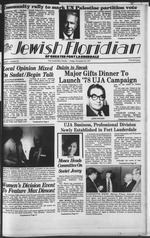 English-Jewish Newspapers, and the Florida Press Association. limb. But it's all heartening." would not belittle it in any way. when he spoke to the Knesset. Helen Nathan of Tamarac w.
Egypt. It is an open question"! Jews for many years to conn,! jg again bespeaks Israel's desire for peace as Sadat's bespeaks his. ::::: their yearning for peace. | that has hitherto characterized the Arab stand. | 'east, to give his efforts their support. Iwemust not let it slip away." lime since the Yom Kippur War. Sfugogut ft Mashgiach en premise! to respect the "legitimate rights"
Soviet joint declaration Oct. 1.
ut taste is a must. I wanted less tar. But not less taste. Winston Lights, I wouldn't smoke. LIGHTS 12 mg "tar". 0.9 ng ntcotne >. per ogantte. FTC Reoort AUG 77: LIGHT MW= 13 atg. "tr.1.0 Mf. a person who helped the Jews. of people moved through it. on marble plaques set in the floor. $60,000 to settle one family. first of many more like it. the 90 children who live there. over to share in kibbutz life. in the South with nowhere to go. still standing after 2,000 years. the second on the eve of Shabbot. the oldest cemetery in the world. years, ending in mass suicide. than to live as slaves. nomads have put down roots. On our last day we visited. a feeling of self-respect have! Temple Emano-EI Sisterhood Activity -10 a.m. to 2 p.m.
Temple Emanu-EI Sisterhood Activity -10 a.m. lo 2 p.m.
with Chanukah observance 10 a.m.
Woodlands North ORT Orientation 1 p.m.
Temple Sholom Auction & Bazaar 8 p. m.
flight is a big, wide-cabin DC-10. as the Florida sun itself. left are Mr. and Mrs. Morris Weiner, and Mr.
principal is at the right. Shown also at the high school in Haifa is Mrs. Bernard Pachter. Malben Home for the Aged. are pleased with their gift mementos. mementos from Federation president Jacob Brodzki. presence in Israel was a special meeting! Woodlanders Mrs. Jack Nudelman, Diane Katz and Mrs.
Clarence Obletz shown atop Masada. UJA Mission's departure for home. enjoys a stop for dinner. From left are Mr.
sible during the 1978 campaign. ard and Palm Beach Counties. the Lauderdale Lakes City Hall. at 2 p.m., and again at 7:30 p.m.
801 E LAS OLAS BLVD. the details on them: Right, the K.C. Strip, with double seamed stitching down the! lies and lead holiday songs. Fran Sindell, and Shirley Stern. ner for men only. The dinner will be held at the home of Seymour S.
speaker in the home of Irene Danker. A, better quality Kosher Butcher Shops. Food S.oree and De..ya. Coast-.o-Coaa..
and Rabbi Simcha Freedman, N.D.V.H. if A DIVISION OF CONTINENTAL INC.
United Synagogue Youth, and Pioneer Women. Leonard S. /.oil. Jewish Federation chaplain. Recognition Day; and Paul Zimmerman, vice chairman of WECARE. service to the WECARE program this year. office by Wednesday, Nov. 30 from 9 a.m. until 5 p.m.
eration office on Dec. 1 at 10 a.m. Greater Fort Lauderdale. and the WECARE volunteer visit?" Home on Saturday, Nov. 12.
luncheon and presented awards to all the volunteers. of religious services each month. ^ment of Oct. 1. Sen.
outlined it to the WJC. statement but that the U.S.
Ration at home is oner. urity and economic aid to Israel. was re-elected to a third term. quility" of the Middle East. the countries in which they live"
peace in their entire history." about a final conclusion," he said. good will of another state." $32.50) if you subscribe to our annual lawn care program. kah Sabbath dinner will be held. Rabbi Skop and Cantor Jacob J.
Monday, Dec. 12, from 10 a.m.
progress at all area synagogues. days from 8 to 10 p.m.
Bible," instructed by Rabbi Zoll. Lee, the son of Mr. and Mrs.
Bar Mitzvah on Saturday, Nov.
Coral Springs, on Saturday, Nov.
A kiddush followed the service. In honor of the occasion, Mr.
Shabbat services on Friday, Nov.
to continue into the high school. dren will sing Chanukah songs. Seminole Middle School at 8 p.m.
Mrs. Morris Render and Mrs.
kah on Monday, Dec. 5, at 2 p.m.
Tickets are on sale at the JCC. Sunday, Dec. 4 and Sunday, Dec.
and may be made at the JCC. to the JCC at 4 p.m.
a trip to the Monkey Jungle. up with a movie and popcorn. their return. The day wfflJ! Day School, who will sing. award for four consecutive years. :: his announcement said, "Help save a life, be a blood donor!" Edith Morgano, WECARE chairman of New Eyes for the! g at the Jewish Federation office. :: nition Day at the Gait Ocean Hotel and unable to attend may;. S office. Ask for Myrna Felt, WECARE coordinator. A Chanukah rally will take place Wednesday evening, [*! behalf of the Jewish Federation's United Jewish Appeal camp"
Bermuda Club B'nai B'rith Lodge. Gestapo, will be the guest speaker. Seci by Dr. and Mrs. I Richard Geronemus and Dr.
Jerald Lynn, Dr. and Mrs.
Jonah Botknecht, Dr. and Mrs.
Marc Morganstine, Dr. and Mrs.
Robert Schultz, Dr. and Mrs.
Lawrence Levine, Dr. and Mrs.
Denis Trupkin and Dr. and Mrs.
Committee is headed by Gary R.
I New Realities in Israel." ler will also be on the program. |iano Park Blvd. Rabbi Philip A.
iti. Cantor Maurice Neu (42). Rabbi Sheldon J. Harr (44). JOM TEMPLE. 132 SE 11th Ave.
*'vative Rabbi Morrl* A. SKop.
. Reform. Rabbi Leonard Zoll. Israel from 1975 to the present. Semitism in all its forms." increased vigilance on our part." 8 p.m. in the Club House.